Ian Poultergeist trapped in this TV. 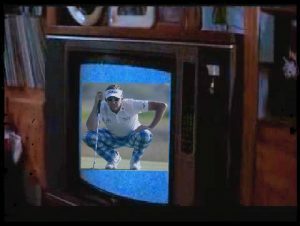 Buckinghamshire, England – Professional golfer Ian Poultergeist who is known for his bold fashion has somehow gotten trapped in an old television set. Becoming trapped in a television set is quite uncommon but has been known to happen from time to time, especially in England. Ian Poultergeist’s golf caddie says Ian will continue to play in all upcoming tournaments that Ian has had scheduled for the 2017 season.